Our increasing ability to investigate the human brain, safely and non-invasively – and now in a normal, everyday setting – seriously challenges the maiming and killing of many thousands of animals in experiments to purportedly aid research into psychological and neural mechanisms. What if we could perform medical-grade brain scanning from the comfort of or own homes? What if a device could monitor the brains of individuals at risk for strokes or seizures - while they went about their daily activities? Researchers at the Korea Advanced Institute for Science and Technology (KAIST), in conjunction with their startup company Obelab, have modified an emerging neuroimaging tool to make it lighter, portable, and precise enough to compete with the giant MRI machines used in hospitals and laboratories. Their imaging machine, known as NIRSIT, made waves last October at the Society for Neuroscience Conference held in Chicago, by demonstrating how NIRSIT can perform comparably to a standard functional MRI (fMRI). At less than a pound and with an 8-hour battery, NIRSIT removes the restrictions imposed by immobilization in a massive machine contained at a medical facility. NIRSIT uses a technique known as near-infrared spectroscopy (NIRS), which shoots light through the brain and measures the characteristics of the light received on the other side. Different chemicals absorb and emit different frequencies of light, allowing scientists to determine the composition of the molecules inside the brain. Because activated brain cells must be supplied with oxygen, researchers can use NIRS to see which brain regions are most active at any given time. 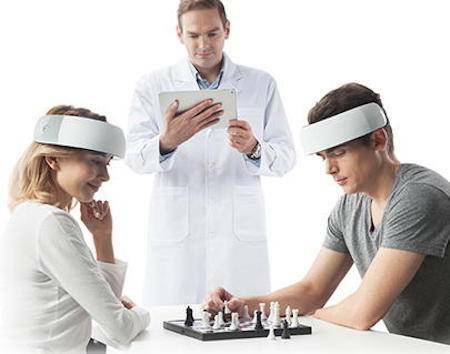 But what this lightweight and portable scanner really delivers is the ability to perform real-time measurement of cognitive changes in the brain as the person goes about normal activities. This means it can be used like standard fMRI to explore psychological processes such as learning, memory, addiction, pain perception, mood states, depression and anxiety. But now these studies can be carried out in the course of daily life. Right now experimenters at Duke University and University of Pennsylvania are using monkeys to study brain pathways activated during altruistic behavior. 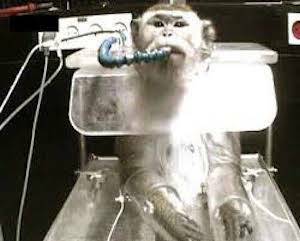 These cruel and invasive experiments involve inserting brain electrodes, restraining intelligent and sensitive animals in whole body restraint chairs, and elaborate training sessions with a small reward of fruit juice to get them to comply. With progress in brain imaging like NIRSIT, these types of experiments can and should be carried out safely and effectively with human volunteers – not animals – allowing scientists to derive information that is 100% relevant to the human brain. NIRSIT can also investigate neural mechanisms behind diseases like Alzheimer’s, Parkinson’s, autism and multiple sclerosis to aid in understanding where normal brain function has been disrupted by disease. 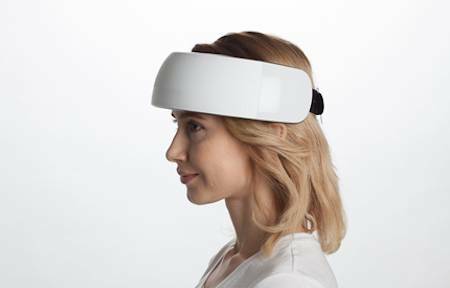 NIRSIT is set to launch in 2016, and the world of neuroimaging may never be the same. The portable NIRSIT is not just another neuroimaging method, but the next step in neuroimaging research, greatly expanding the capabilities for non-invasively delving into the workings of the human brain, and bringing us closer to ending the indefensible use of animals in brain research.